Reference number for this case: 22-Oct-54-Wittenheim. Thank you for including this reference number in any correspondence with me regarding this case. The regional newspaper L'Alsace for October 24, 1954, reported on page 7 that a flying saucer made an extraordinary appearance in the sky of Wittenheim on October 22, 1954, starting at 11:10 p.m. Numerous people had left the "Palace" movie theater, and some of them went to the Zimmermann-Thomas coffee shop to chat and have a drink before going home. Suddenly a man rushed into the room, very excited, shouting to the awestruck people: "you who don't believe in it, come outside! Have a look!" The consumers rushed out, joining numerous cyclists and passersby who were on the road or in Wittenheim, or in the Jeune Bois district, and they were watching this display "both upsetting and convincing." The man who gave the alert to the people in the coffee shop was Eugène Stattner, Wittenheim - Jeune Bois resident and working in the administration service of the city of Mulhouse. He had been at the movie theater too. At the end of the movie, he got into his car and, headlights on, started to drive to the Jeune Bois district. At 11:10 p.m., he suddenly saw what he called a flying saucer. Then he rushed into the coffee shop to come out again with the hope that the phenomenon was still there. Not only the saucer had not disappeared, but it performed "a most extraordinary show." The craft that came from the direction of the Anna mine, was going towards the Jeune Bois district, slowly. The saucer was in fast rotation on itself, in a movement of double rotation, and, in the very clear sky, it was perfectly visible. It was swirling like a carrousel, on its edges, around a dark center core that was perfectly motionless, and in addition it rotated on itself by successive and close reversing, always around its center core. This resulted that in the first rotation pass, the craft looked like a big plate, and it the second pass, it looked like a long spindle or a cigar. The newspaper indicates that the saucer "apparently measured 1 meter in diameter" and that according to Mr. Stattner it flew at about 500 meters of altitude. The newspaper said that if these figures were correct, "the real size of the craft would have been considerable". Mr. Stattner had said that the craft seemed to be "wandering in the sky", and took about ten minutes to go from the Anna mine well to the Théodore mine well passing on the Jeune Bois district. It occurred in absolute silence. The external rim of the saucer changed from the red to the brown, then to a sharp red, while the central core was glowing, surrounded by sparkles. A reflection like that of a fire lighted the landscape. When the saucer was above the Théodore mine well, still in the most complete silence, it strongly accelerated, and at an "incredible speed," it "disappeared n the middle of the sky." The newspaper offered no ordinary explanation, and this this time they did not scoff at the observation, because of the large number of witnesses and the other numerous observations that occurred in the area these days. In 2004, Christian Valentin, former journalist who researched the UFO history in Alsace, explained that he interviewed Jean-Marie Stattner, son of Eugène Stattner, in 2004. He learned that the father, the mother and the son were in the car, back from the movie theater that October 22, 1954, when the father stopped the car, came out, followed by the son, to better observe an oval luminous object, motionless in the sky, in the direction of the Théodore district. The father then rushed into a nearby restaurant, the Zimmermann coffee shop, to alert the people there, and more than a dozen people had then observed the object, during more time than the father and the son previously, while the mother observed the phenomenon from inside the car. The object then rushed into the direction of the Théodore district. The next day, or two days later, the father went to the gendarmerie station to file a report about the observation; the son now thinks that he might have been invited to do so by the gendarmes. in his memory, the gendarmes were talking about a weather balloon, wondering how a weather balloon could have emitted so much light. It was as a consequence of this affair that in Wittenheim, another of the witnesses had sculpted a "Martian" in a beet. which had been shown at the Zimmermann coffee shop and photographed by the Press, leading decades later the debunkers Barthel and Brucker to claim they had "solved the case" as a hoax. The son remembers the atmosphere of unfair scoffing that had deeply affected his father, and the son himself still wonders what the thing they observed was. We reported in our last issue on the one hand the triple appearance of a red globe on Thursday night at 06:40 p.m., 07:30 p.m. and after 08:00 p.m. and on the other hand, the double passing, the day before, of a ball of same color above Wittenheim, at 11:20 p.m. and 00:50 a.m.
Then, on the night from Friday to Saturday, a phenomenon occurred, which is an absolutely irrefutable testimony by the sharpness of the appearance and also by the number of people who observed it. It was 11:10 p.m.. Many spectators had left the "Palace" movie theater. Some of them went to the Zimmermann-Thomas cafe to chat and eat before returning home. Suddenly a man burst into the room. Deeply moved, he said to the stunned people: "you who do not believe in it, get out! Come and see! "It was a general rush. And the sight that met not only the consumers but also the countless cyclists and pedestrians who at that time were on the road or even in Wittenheim, or in Jeune Bois, was both shocking and compelling. The man who had thus attracted the attention of consumers was Mr. Eugène Stattner, living in Wittenheim-Jeune Bois and working in the service of the municipal administration of Mulhouse. He had also been at the movie. At the end of the show he got into his car and all lights on, drove to the Jeune Bois district. It was 11:10 p.m., when he suddenly saw what he calls himself a flying saucer. Then he rushed into the coffee shop to come out soon with the hope that in the meantime the phenomenon had not fainted. Not only the saucer had not disappeared, but it gave an extraordinary demonstration to say the least. The craft coming from the direction of the Anna mine was heading towards the Jeune Bois district. Whereas the race was slow, the saucer turned briskly on itself in a double rotation, and - the sky being very clear - it was clearly visible: first the saucer was spinning like a carousel, on its edges around a central core perfectly still, on the other hand, the craft was on a rotation on itself in successive and frequent reversals, always around a central core. What makes - and the importance of this finding is significant - in the first case of rotation, the apparatus had the appearance of a large plate and in the second case, an extended spindle, or if is preferred, a cigar. This would be a simple explanation and perfectly valid as to the form of aerial vehicles designated by the names of flying saucer and flying cigar. The saucer apparently measured 1 m in diameter. But according to Mr. Stattner it was flying at about 500 m altitude. If these figures are accurate, the actual dimensions of the craft would be considerable. The craft, which, in the words of Mr. Stattner seemed to frolic in the sky, used about ten minutes to go to the Anna mine well to the Theodore mine well through Jeune Bois. The observation was therefore particularly easy. The silence was absolute. The outer edge of the saucer went from red to brown to bright red, while the core was glowing, surrounded by a shower of sparks. A fire reflection illuminated the landscape. Suddenly, while the saucer was above the Theodore mine, and still in the most absolute silence, a tremendous acceleration occurred at an incredible speed, the machine disappeared in the sky. These are the facts. It is not up to us to comment on them but hearing it leaves us wondering. This is, in any case, one of the most accurate report we had, to date, to report here. Like everything, a priori, that arouses disbelief, the "saucer" theme can be open to irony and even joking. We had also indulged in this aspect of the matter. It must be recognized that a significant amount of courage is needed today to a single person that chance made a witness to one of those strange apparitions that occur for some time in the sky, to publicly tell his adventure. This courage, recently, came to L'Alsace readers. The good faith of the railwayman of Jettingen-Berentzwiller was not in doubt for those who knew him, and for us. That of the farmer of Dornach was equally. Their testimony, marked by good sense and the most scrupulous honesty, now find in what several hundred people at once saw, a striking confirmation. Christian Valentin interviewed Jean-Marie Stattner in 2004. He is the son of a witness of a light in the sky in Wittenheim on October 22, 1954. His father, his mother and himself were in the family's car returning from the movie thater, and his father stopped the car and went out, followed by his son, for better seeing a motionless luminous oval object in the sky, located in the direction of Cité Theodore. His father then rushed into a close nearby restaurant, Café Zimmermann, to warn people and more than ten people then observed the object, during more time together than the father and the son previously, while the mother observed the phenomenon from inside the car. The object then slipped by in the direction of Cité Théodore. The following day or two days after the sighting, the father went to the gendarmerie, the office of the law enforcement forces, to submit his report about his sighting, his son now thinking that it might have been the gendarmes who asked him to. In he son's memories, the gendarmes spoke of weather balloons, and wondered how a weather balloon could have emitted so much light. A follow up of this case is that in Wittenheim, another of the witnesses had carved a "Martian" out of an odd-shaped large beet, which had been shown at Café Zimmermann and had been photographed by the press, driving decades later debunkers Barthel and Brucker to claim hey "explained the case" as being a hoax. The son remembers the unfair atmosphere of derision which had much affected his father, and he still wonders what it was they saw. It is quite remarkable thet this observation, certainly one of the most puzzling both the 1954 saucer flap in France, and of the Alsace sightings catalogue, there is absolutely no mention of it in the UFO literature. Christian Valentin alone wrote about it and investigated it. I did publish the data available before 2005, i.e. [cv1], in my catalogue of the 1954 French flap, but nobody cared, between 2005 and 2014, to copy it ot even mention it, whereas so many other cases from my catalogue were - generally dishonestly by removing any possible or certain trivial explanation I offered. Like the son reported to Christian Valentin, the "Martian" sculpted in a beet the next day, this simple innocent prank, was widely printed as a genuine "encounter of the third kind" of an "alien creature shaped like a radish" that would have haunted Wittenheim. Let's try to locate the events. 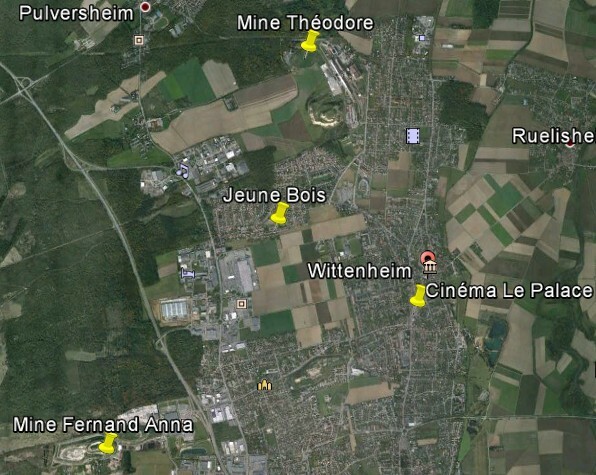 Wittenheim is 6 kilometers in the north of Mulhouse in the Haut-Rhin. This is a populated area and was a populated area in 1954. It is in a flat country and it is very dubious that a meteor would only have been reported from there. There are several other sightings reported in the Haut-Rhin for that day, but none matches the hour of the Wittenheim sighting. Not only the description, but also the duration of about 10 minutes totally excludes a meteor. [la1] "Une soucoupe volante fait une extraordinaire démonstration dans le ciel de Wittenheim", article in the regional newspaper L'Alsace, France, page 7, October 24, 1954. [cv1] "1954, l'année des OVNIS - Des observations par dizaines, des témoins par centaines", article by Christian Valentin in "Saisons d'Alsace", quarterly magazine, Dernières Nouvelles d'Alsace publisher, Strasbourg, France, page 98, summer 2004. [cv2] "Mythes et Réalités des Phénomènes Aériens Non Identifiés - Histoire des soucoupes volantes en Alsace jusqu'en 1980", book by Christian Valentin, Grimoires d'Alsace publishers, France, page 50, 2012. 0.1 Patrick Gross April 23, 2005 First published. 3.1 Patrick Gross February 6, 2015 Additions [la1], [cv2], Explanations. This page was last updated on February 6, 2015.